Living with diabetes can be challenging for many people because diabetes causes many other issues. When you learn that you have diabetes it might just be a step towards making healthier decisions. When it comes to your eyes, you should make sure you have regular eye examinations to prevent any potential problems. Diabetic eye diseases can cause serious damage to your eyes. Diabetic retinopathy is the most common diabetic eye disease and a leading cause of blindness in American adults. In the majority of diabetic retinopathy cases, blindness is completely preventable. Patients will need to work closely with their Hawaii diabetic retina eye doctors to monitor and treat this disease. The use of medications and daily blood sugar monitoring can make a major impact on containing the worsening of diabetic retinopathy. The retina is the like the film in a camera; in which it is the light sensing film on the back of the eye that captures the images. 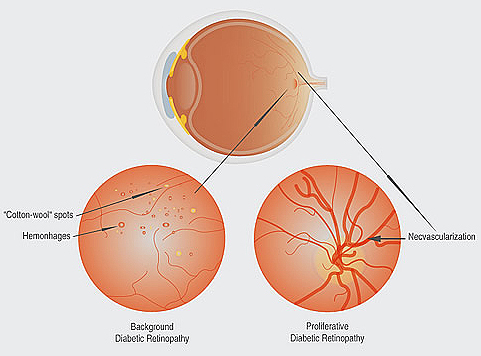 In the diabetes disease, sugar (glucose) builds up within blood vessels in the retina and tissues of the body causing it to attach to the proteins in the wall. This alters the vessel’s normal structure and functioning. The vessels eventually get blocked and leak fluid. When they cannot deliver an adequate amount of blood supply to the eye, the eye can generate abnormal new blood vessels. Early diabetic retinopathy usually has no symptoms. However, worsening diabetic retinopathy can lead to visual loss and blindness. The stages of diabetic retinopathy are divided into two categories, nonproliferative retinopathy and proliferative retinopathy. This is the first and earliest stage of diabetic retinopathy. NPDR occurs when the small blood vessels of the retina start to leak fluid or bleed. This activity will lead to the formation of deposits called exudates. Once these blood vessels start to leak swelling within the central part of the retina occurs. When the leakage of these blood vessels causes swelling, macular edema sets in and the blood vessels can become blocked. This stage of diabetic retinopathy is common when a person develops diabetes. Most diabetics have some grade of NPDR. It is imperative to maintain regular eye examinations with the retina specialists at our practice to monitor and treat NPDR. When new vessels start to grow as a result of the existing vessels becoming blocked, this marks the beginning of the next stage of diabetic retinopathy, proliferative diabetic retinopathy. This level of diabetic retinopathy is the most severe and dangerous for the diabetic patient. These new abnormal blood vessels can grow on the retina, optic nerve, iris or into the vitreous gel inside the eye, and tend to grow poorly and are very fragile. The damage that these blood vessels bring to retina can be catastrophic and include hemorrhages on the retina, scar tissues build up, and possible retina detachment. If you are a diabetic patient it is suggested that you have regular eye exams to look for symptoms. Diabetic retinopathy does not really have any initial warning signs. *If proliferative diabetic retinopathy is left untreated blindness can occur. The best alternative to fighting PDR is early detection so that you and your eye doctor can begin to control this development. Early detection saves vision! Our eye doctors will detect diabetic retinopathy through regular eye exams with their diabetic patients. In the earliest stages of diabetes, eye exams once or twice a year may be acceptable. The doctors will be specifically looking for the leaking blood vessels that can lead to more advanced levels of this eye disease. A dilated eye exam will be performed by your eye doctor and retinal photographic equipment will be used. Laser treatments – These laser treatments are also known as photocoagulation. The laser uses controlled bursts to seal leaking blood vessels, destroy abnormal blood vessels, seal retinal tears and remove abnormal tissue that has formed on the back of the eye. Intraocular corticosteroids – Many studies have been conducted recently with these types of injections. They may reduce retinal swelling and improve visual acuity in patients with diabetic macular edema. Vitrectomy – A vitrectomy may be performed to clear blood and debris from the eye, to remove scar tissue, or to alleviate traction on the retina. The vitrectomy actually removes vitreous gel from the eye through a small incision using a laser. Vitrectomy allows the retina to flatten. Depending on the severity of the diabetic retinopathy, gas or air might be placed in the eye to replace the vitreous fluid that was removed. This gas or air helps smooth out the retina and prevent retinal detachment.